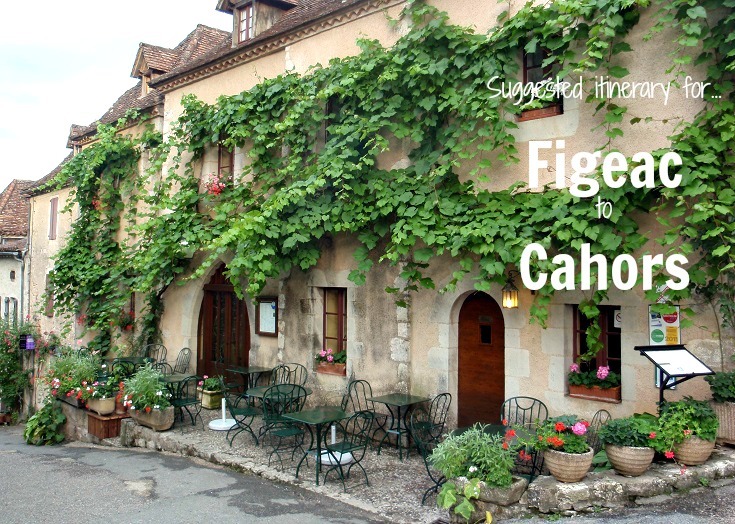 There are a couple of paths that a long-distance walker can follow from Figeac to Cahors—each offers a different experience and caters to different needs. 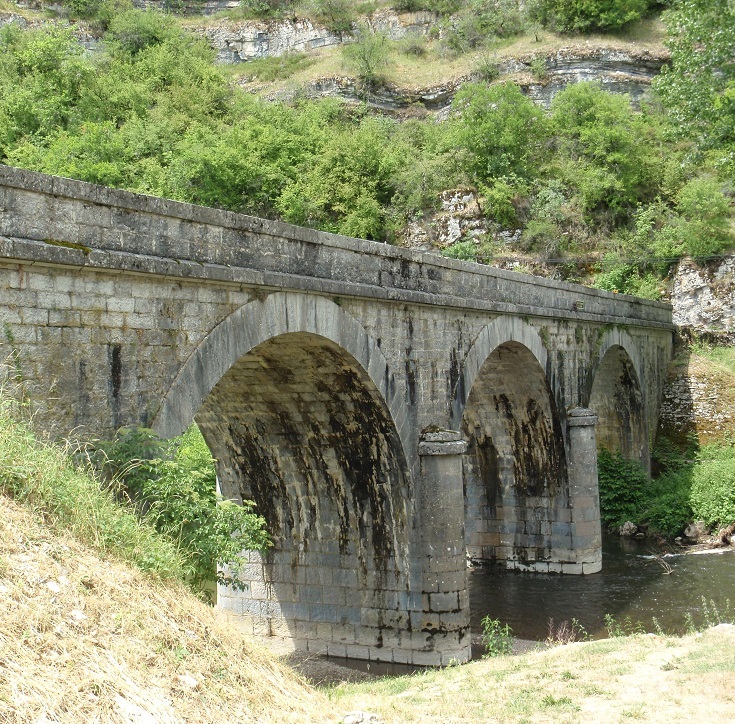 If you are following the pilgrims’ trail along the Chemin de Saint-Jacques from Le-Puy-en-Velay to Saint-Jean-Pied-de-Port and on to Santiago in Spain, then the traditional route of eighty-seven kilometres (54.4 miles) along the GR 65 is for you. This route offers a glimpse into life in rural France as the locals experience it, passing through tiny hamlets and visiting the bustling market towns of Cajarc and Limogne-en-Quercy. Aside from other walkers, tourists are not as common in the towns along this path and English is less likely to be spoken. 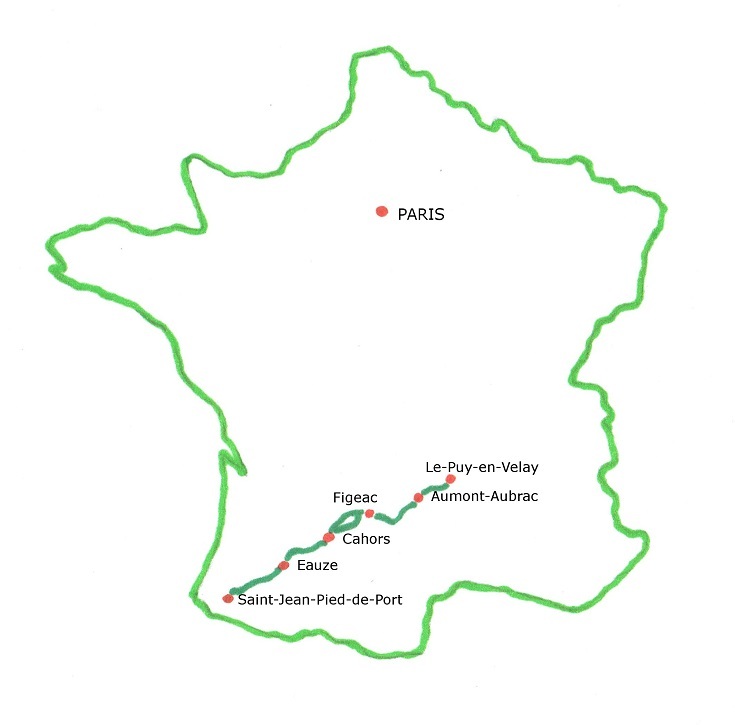 If you choose this route, keep your Useful French Phrases page handy (from the I Love Walking in France guidebook), smile a lot and give it your best shot. I have always found that any attempt to speak French is most appreciated and the locals are more than happy to help. If it is not important to you to follow the traditional pilgrims’ trail on this walk, then the more northerly route along the GR 651 and GR 36-46 offers some real highlights including the ‘most beautiful village’ of Saint-Cirq-Lapopie, the painted caves at Pech Merle near Cabrerets and the ruins of the ancient abbey at Marcilhac-sur-Célé. This route is a little longer at 108 kilometres (67.5 miles). If you do not need to finish your walk in Cahors, then a loop of 147 kilometres (91.9 miles), starting and finishing in Figeac, can incorporate all the highlights. 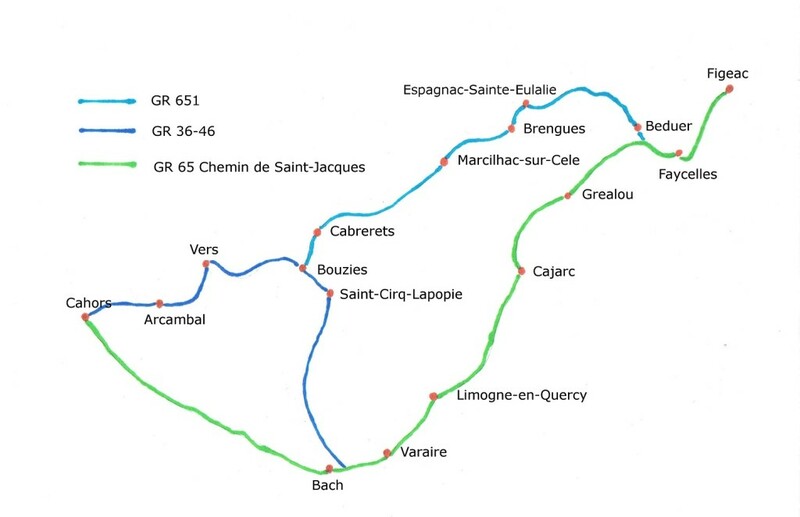 This route follows the Chemin de Saint-Jacques along the GR 65 almost as far as Bach, then cuts north along the GR 36-46 to Saint-Cirq-Lapopie and returns to Figeac along the GR 651. 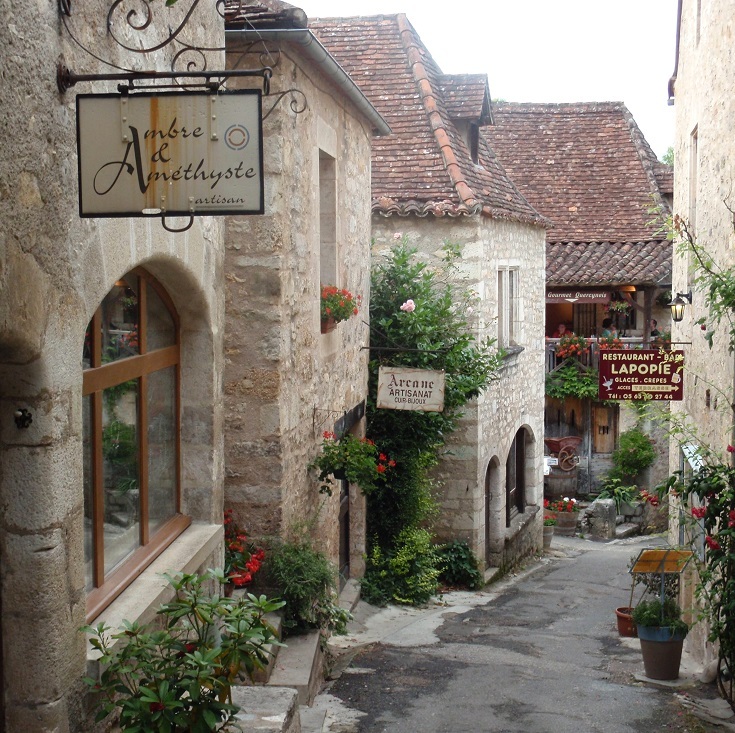 Classified a ville d’art et d’histoire, Figeac is a beautiful town of almost 10,000 people spanning the River Lot. 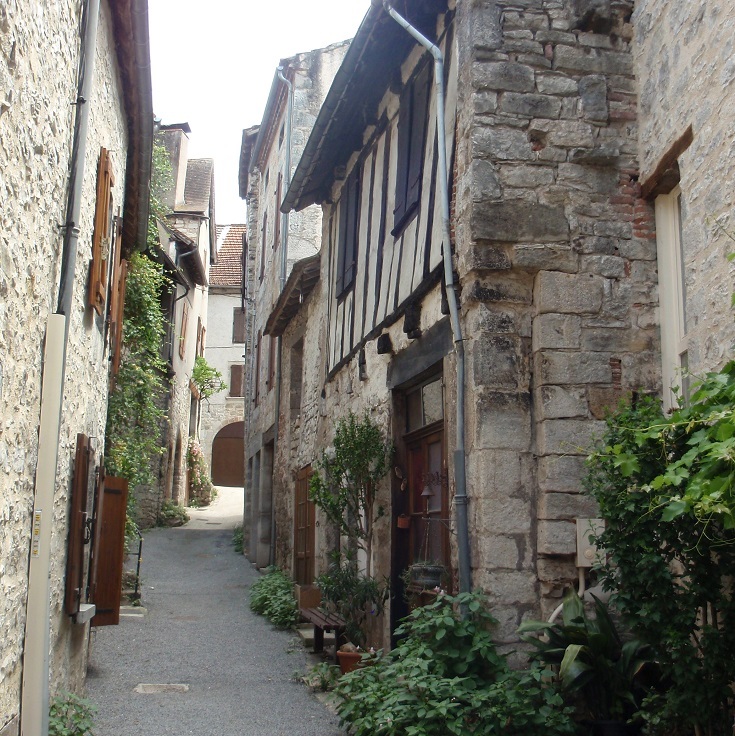 Filled with medieval stone and timbered houses, the backstreets and crooked alleys are a delight to wander through. 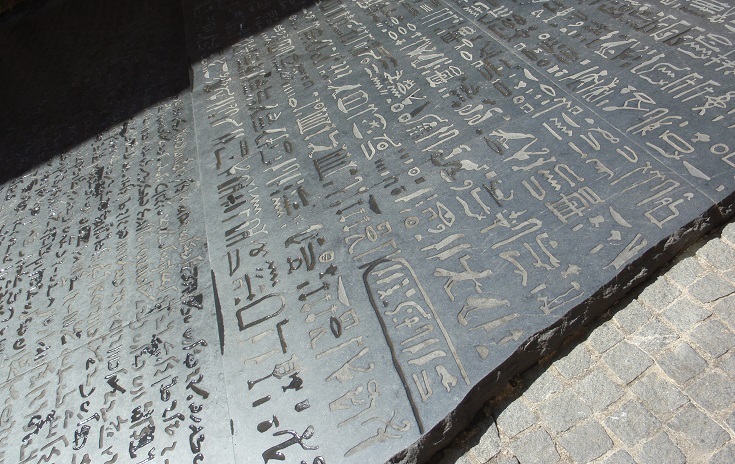 Figeac was the birthplace of Jean-François Champollion, the nineteenth-century French scholar who spent more than a decade deciphering the hieroglyphics of the Rosetta Stone. His home is now a museum where you can explore the history of writing. If you have been walking since Le-Puy-en-Velay and have not yet stopped for a rest day, Figeac is the perfect place to take a break. The town boasts a full range of services—dozens of cafés, patisseries, chocolateries as well as the ever-useful banks, doctors, dentists and ATMs! Within an hour’s drive from Figeac, you can visit the village of Rocamadour whose ancient buildings cling to the side of the cliff above the River Lot. Venture north for a further one-hour drive and stop to explore one of six of France’s ‘most beautiful villages’. My pick would be Collonges-la-Rouge but you can discover them all here. For something completely different, visit the underground lakes and caves, 103 metres below the surface at Gouffre de Padirac. 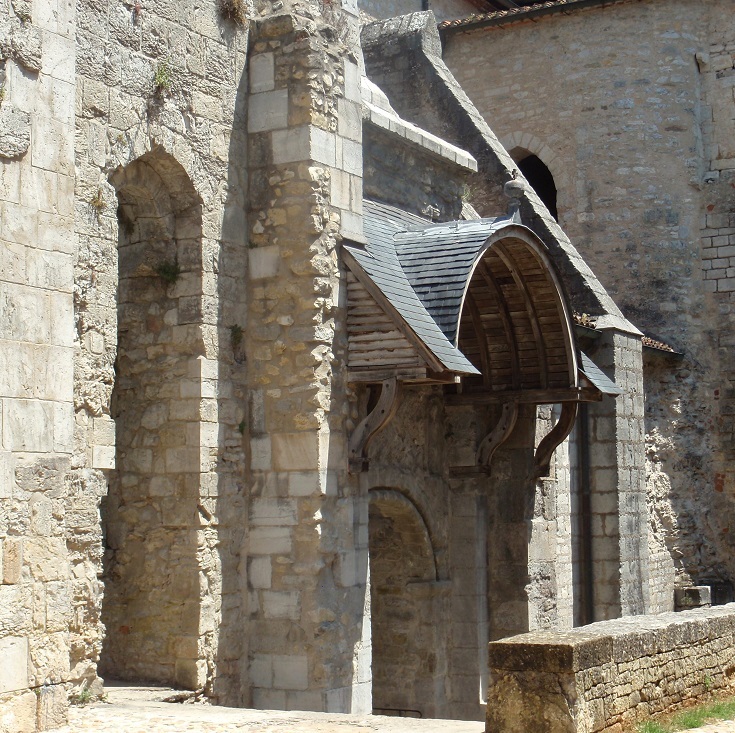 In the tenth century, Benedictine monks built an abbey—dedicated to Saint-Pierre—on the banks of the River Célé. All that remains of that abbey is the Chapter House where the monks met, but you’ll see glimpses of the original splendour in the ancient columns and the tympanum above the entrance. Take a look around here. Saint-Cirq-Lapopie is a jewel among France’s ‘most beautiful villages’ and offers a bewildering array of cafés, gift shops and impossibly pretty houses. I think it requires a full-day visit to do it justice (preferably on a Wednesday when the summer market sets up in the late afternoon), otherwise you’ll be planning a return visit as you walk out of town. This stunning village is the main reason I recommend taking the northerly route along the GR 651 and GR 36-46 rather than the traditional pilgrims’ trail but take a sneak peek here and decide for yourself. Cahors is famous for its red wine, made primarily from Malbec grapes and supplemented with Merlot and Tannat. Production of the wine is governed by the AOC (Appellation d’Origine Controlée) which sets strict guidelines on care of the vines, soil and harvesting times and methods. Wines produced under these regulations are dependent on the mercy of the sunshine and local rainfall and result in vintages which vary from year to year. But they all contain a large dose of love (and none of the chemicals which give me a headache!). If you have an afternoon to spare, ask at the Tourist Office about winery tours. You’ll find more ideas for whiling away an afternoon in Cahors here. No matter which route you follow, you’ll find fresh food markets along the way. Some operate only during the summer months, so make the most of the plentiful seasonal produce and pack a picnic lunch for the day’s walk. 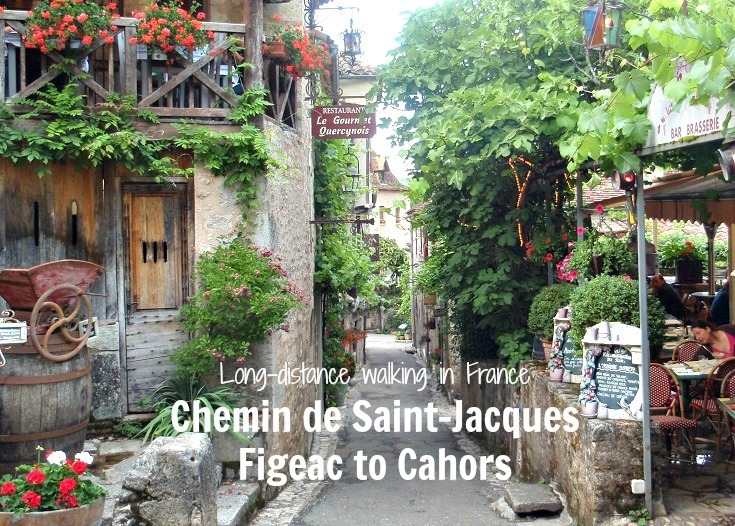 The two paths from Figeac to Cahors offer quite different experiences and, if you are not continuing on to Saint-Jean-Pied-de-Port, it is possible to enjoy both on a nine-day loop starting and ending in Figeac (I provide a suggested itinerary for this loop in the I Love Walking in France guidebook). Of course, if you are walking from Le-Puy-en-Velay to Saint-Jean-Pied-de-Port (perhaps over several holidays), then a loop is of no use to you! Since only a dedicated pilgrim could be this close to Saint-Cirq-Lapopie and not call in, my suggested itinerary follows the northerly GR 651 and GR 36-46 paths. It includes a mixture of long and short days and allows plenty of time to visit all the sights. 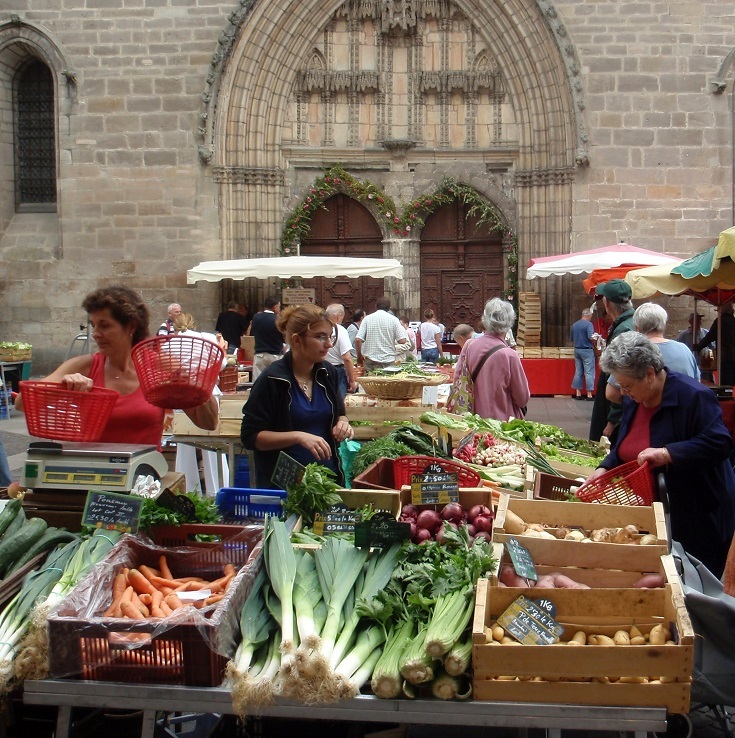 I suggest leaving Figeac on a Saturday afternoon after visiting the morning market which will also bring you to Saint-Cirq-Lapopie in time for the Wednesday evening market. 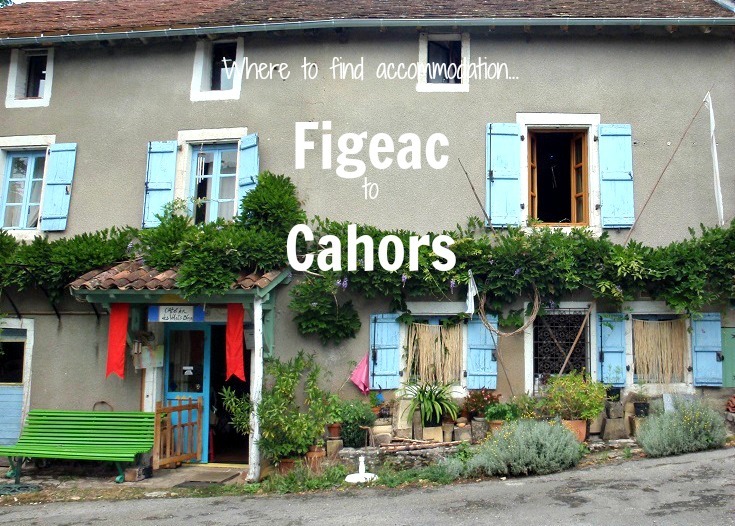 If you prefer to stay in larger towns with a full range of services, your choices for accommodation between Figeac and Cahors are quite limited. But if you are happy to stay in a gîte or chambre d’hôte in one of the many tiny hamlets (and I find this the best way to experience rural France), then it is possible to keep all days under 15 kilometres (9 miles). Accommodation is available in the following villages, with distances given from the starting point of Figeac. Markets stalls brimming with fresh produce, Roman bridges, and window-boxes overflowing with beautiful blooms – what a stunning route. Shawn and I hope to do at least a snippet of the Chemin de Saint-Jacques someday. I hope you do, I know you will love it! I think…after considering all options…I’d like to take them all! Wouldn’t that be nice? I would hate to miss anything you’ve described. I agree Michael, it’s too hard to choose!